We're "connected"! That's right! 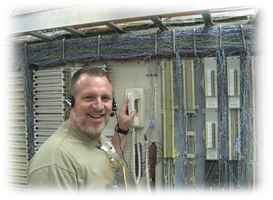 I just got through, as you can see in this picture, wiring up the entire phone system, and network so that we are ready to hear from you! Nah, I'm just kidding! We are not "THAT BIG" ... .yet, anyway! This picture is a headshot shot of me working as a computer rep on a consulting job a couple of years ago! It looks real, right? Hey, seriously, we want to hear from you. We have our newsletter system we're putting into place to keep you posted of things that are going on, through email. We have our website to make information available to you "online" so that you can read and learn and discover as much as you can possibly absorb of the Word of God. And we have our "meetings" starting in January 2010. We're calling it "2010 - The Year We Make Contact"! Remember the movie 2001? Well, that is also the year 's we first started into ministry. Well, 2010 is right around the corner. The sequel to that movie is "2010 - The Year We Make Contact", so I felt it appropriate to use "that" as our slogan for 2010! We're starting the church, setting up the "Heart Attack Recovery Group", and working on other support groups, and in a nutshell, 2010 "is" the year we make contact! With that in mind, let me put out on this page the links and information you will need to "Make Contact" ... with us! In January, 2010, we will begin meetings! January 2010 starts a brand new year for all of us! It also starts a new year for WORD CHURCH! This new year will be the "new beginning" of our ministry's local church meetings. We are currently settling on a place to meet, regularly, and will announce that meeting time/place here on the website. If you are interested in becomming a part of the staff and helping us with the meetings, setup and tear-down, ushering, making phone calls, scheduling, and many other areas where we have needs, please contact pastor Rich as soon as possible. Your help will be greatly appreciated! eNEWSLETTERS SIGN-UP To register / sign-up for our newsletters, you simply go out to a link and put in your email address. The following page that comes up then gives you an option to pick which newsletters we offer at that time that you want to sign up for. If months later you want to change them, you can return to this page to modify your selections. HEART ATTACK RECOVERY GROUP Registration / sign-up for our Heart Attack Recovery Group is simply a matter of signing up upon your first visitation. You will then be notified by email or by postal mail (whichever you designated when you filled out the registration form). When you visit for the first time, you simply fill out a registration form, at the meeting! That's all you do, and then you're signed up! Pastor Rich will be teaching the weekly Bible Study Group, once it starts meeting, with folks who are interested in learning basic Bible foundational teachings from the Word of God. If you are interested in a Bible Study Group, please email us and we will keep you informed when the first meetings begin.